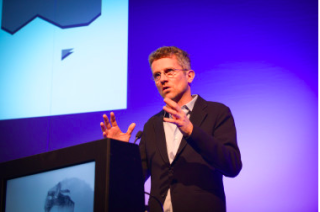 “The best way to predict the future is to create it.” Whether it was Abraham Lincoln or Peter Drucker who first said it, it was certainly a key theme for Professor Carlo Ratti at the ISE Opening Address. For Ratti, the Internet of Things (IoT), which he sees as the second wave of the internet, can transform our cities no less than it is transforming our homes in the shape of smart homes, or our factories in terms of Industry 4.0. There are, he explained, three key aspects of this transformation: mobility, offices, and retail. Ratti, architect, engineer and inventor who directs the Senseable City Lab at MIT, believes that the future is full of possibilities about how we want to work and play—and technology is the enabler of those possibilities. He places special emphasis on the idea of convergence: the convergence between different technologies, and the convergence between the digital world and the physical world. Those convergences will enable new applications, new opportunities. He and his team spend significant amounts of time modeling those possibilities for how the city of the future might look, and experimenting with them. He takes as an example self-driving vehicle technology. On the one hand, that could mean a substantial reduction in the number of automobiles that our cities need to support. On the other, it could mean that we abandon mass transit systems in favor of individual transportation. One outcome could be considered positive—the other, less so. We need to know about those possibilities, and make decisions, Ratti believes.